Studio portrait of 3229 Private (Pte) Frederick William Adcock, of Balmain, NSW. 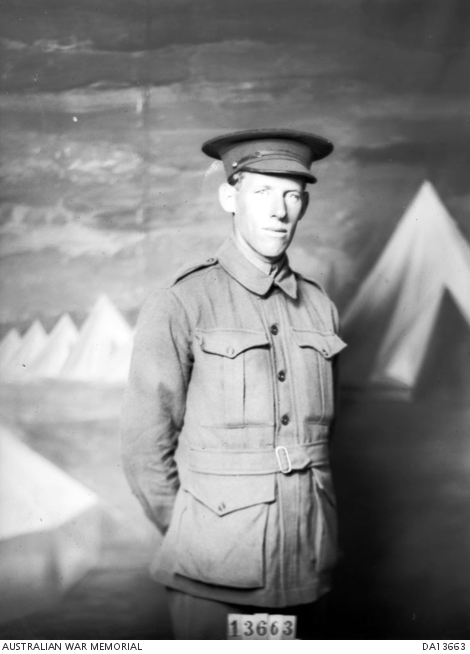 Pte Adcock enlisted on 1 August 1915 and originally embarked aboard HMAT Euripides in Sydney on 2 November 1915 with the 11th Reinforcements, 3rd Battalion. He disembarked two days later in Melbourne due to illness. On 1 April 1916 he embarked aboard SS Makarini in Sydney as a member of the 16th Reinforcements, 3rd Battalion. On 20 May 1916 he was transferred to the Pioneer Training Battalion. On 1 April 1917 he was transferred to the 2nd Pioneer Battalion. He was promoted to sergeant on 18 January 1919. Sergeant Adcock embarked aboard HMT Main on 23 July 1919 to return to Australia.